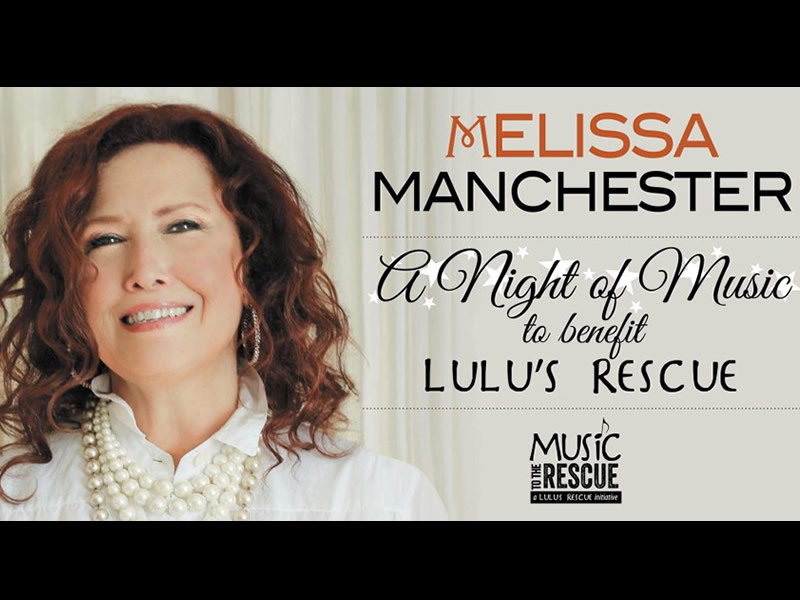 Grammy award winning entertainer Melissa Manchester joins us for an intimate night of music to benefit Lulu’s Rescue, a local 501(c)3 all-breed inclusive dog rescue. Known for her hits “Midnight Blue” and “Don’t Cry Out Loud,” Melissa Manchester’s career is remarkable not only for its longevity and accomplishments, but for its versatility. Melissa has recorded twenty-one albums across her career, and her critically acclaimed recent albums honor the iconic male and female singers who influenced her music. All tickets include a Meet & Greet with Melissa after the show. VIP tickets include dinner and priority access during the Meet & Greet. Opening act, New Jersey Songwriter and local favorite Russell Norkevich, offers his own brand of piano driven song. He is musically influenced by the likes of Elton John, Brian Wilson, Bob Dylan, Nina Simone and the Beatles. Russell frequently performs his original and cover songs (including a 45 minute Elton John set) at local restaurants and wineries in the Hunterdon and Bucks County areas. Can I pick my own seat? The best way to access our seating map is by using a desktop computer and any browser excluding Google Chrome. Once a seat is chosen and paid for, we will not be able to change the seating. Please choose carefully. If you happen to purchase tickets on your phone and the seating map was not available to you, the computer will automatically choose the closest and best seats available. Do we have a table or assigned seats to this show? All of our seating is Cabaret Style seating, all tables are 4 person tables. If you have a party larger than four you can access the seating map and purchase tables next to or near by. We will not push the tables together for the show. Can I bring in my own food and drink? No, we do not allow outside food or drink. Snacks and drinks are available for purchase in the venue. Security guards at the door will ask to check purses and pockets before you enter the venue, this is also a safety precaution for all of our guests. Do you serve dinner during the show? No, we do not have table service or dinner service during the show. We have a small bar in the left hand corner of the venue where you may purchase wine, beer, cocktails, and snacks. If you would like to have dinner before the show please call our resturant, The Pour House at the New Hope Winery, at 215-794-2331 or on Opentable. We recommend reservations for dinner no later than 6:30 for our Tuesday-Saturday shows, and 4:30 for our earlier Sunday shows. Our minimum age requirement for shows is 8 or older. We do not offer refunds for shows, unless the show is cancelled or rescheduled.